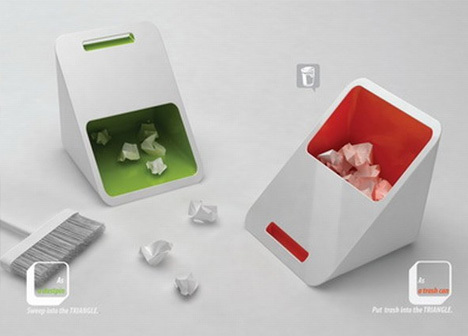 Sweeping the trash is rarely such an attractive activity, which this angled-wedge dustpan-and-garbage-can combination aims to change. Flipped on one side and it serves to scoop up waste for disposal, but turned on its other end the object also works as a garbage or recycling receptacle with a handy cut-out handle for both types of use. Straight sides and back make it easy to place this against a wall or in a corner, and the simple aesthetic (white on the outside and a single color on the interior) make it look as respectable as a normal home trash bin. A built-in-brush (or broom) would, however, make this already-innovative idea even more ingenious. 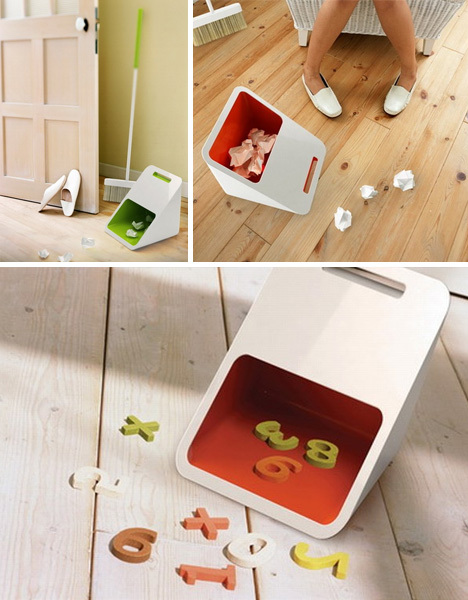 Lufdesign is not the first to create this kind of dual-purpose domestic-waste design but they have put unusually intense attention toward an often-neglected part of contemporary furnishing design – particularly since every house has many such objects, like it or not. As the image shows, there is potentially more to the concept than just taking out the trash too – it would work to clean up and house toys as well.